Former IB chief Dineshwar Sharma will represent government for dialogue in J&K. In the early 1990s, when terrorism was at its peak in the Kashmir Valley, Dineshwar Sharma, a young IPS officer on his first stint, got his initial taste of the violence. Late one night, his Gupkar Road residence was caught in the crossfire. Sharma watched the panicked firing by the security guards for a while and then decided to venture out. Ever the policeman, he wanted to tell his men not to waste ammunition and to fire only when they saw their quarry. As Sharma now ventures out into the Valley once again as central interlocutor, the question is, does the NDA government have its quarry in sight or is it shooting in the dark? All indications so far hint at the latter. In fact, a paper accessed by this author tries to put out the Centre's rationale behind starting a dialogue process three-and-a-half years into the government's tenure. "The current initiative is a manifestation of the government of India's sensitive approach to resolve long standing Kashmir issue [sic]," the paper piously says. But in the same paper, one of the "stakeholders" in the peace process are described as "nothing but a handful of Pakistani stooges" who have been holding “peace loving people to ransom". While that might well be the case, in its choice of words about what it thinks of the Hurriyat Conference, the BJP isn’t helping its own cause. 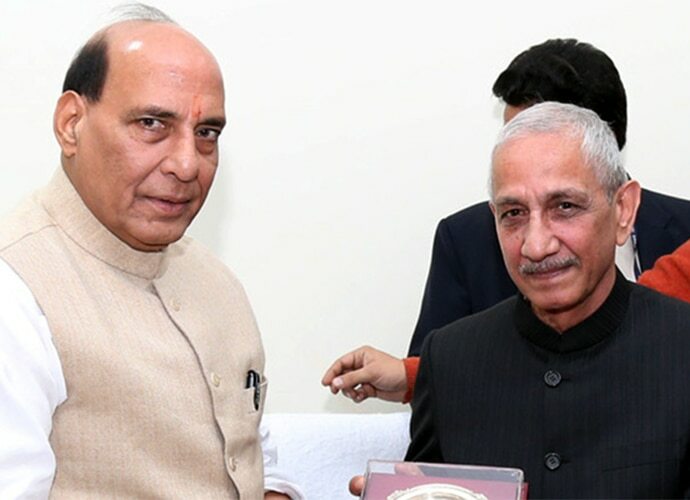 Union home minister Rajnath Singh with former Intelligence Bureau director Dineshwar Sharma. To add to it are the theatrics of it all. Union home minister Rajnath Singh making a grand announcement, at a hurriedly called press conference, that the solution to Kashmir is not through "goli" or "gaali". If the government was really serious, it should have gone about its business quietly and done some groundwork before making the process public, say experts. That statement is meant to indicate that it leaves the Hurriyat out as well as the stone-pelters out. "So whom do you talk to," asks former commodore Uday Bhaskar. "The entire exercise is a put on for the western world that the Modi government is willing to find a political solution and talk to all stakeholders, he adds. Sure enough US secretary of state Tillerson arrives in India late Tuesday night. JNU professor and Kashmir watcher, Happymon Jacob, says the course correction is welcome but "it's a bit too late in the day for it to make any real impact... Also, appointing a former DIB is a bad idea. The government should have selected a senior politician to reach out to the Kashmiris." The Centre's hawkish approach to Kashmir does have its upside. The Hurriyat leadership stands exposed with the NIA (and an India Today sting operation) exposing the funding and hawala deals, especially of the second-rung leadership. But the government has also allowed the political process to wither away. The nadir being the two per cent polling that declared Farooq Abdullah the winner in the Srinagar bypoll. Democracy has abdicated the Valley. "Perhaps it’s time that the Modi government admit that the policies it has followed in the past three and a half years have failed," says Track II expert and Congress leader Mani Shankar Aiyar. But Sushant Sarin of the right-wing Vivekananda Foundation says, "It’s too early to read the tea leaves. Let’s wait for the former DIB to at least make his first visit to the Valley before we allow the naysayers to take over." Already questions are being asked as to whom Sharma will talk to. The stone-pelters don’t listen to the Hurriyat (successive bandh calls post the NIA arrests of the Hurriyat leadership have led to a tepid response each time); the elected PDP government doesn’t have much heft either at the Centre or even within the state. The boat men and the opposition are anyway on board. Clearly, as far as the government is concerned, this isn’t about the quarry being in sight. Sharma might advise the platoon not to waste ammunition, but then is anyone really listening.